Dec 21, 2017, New York ― World Brand Lab released “the World’s 500 Most Influential Brands” (14th edition) list. Google, runner-up of last year’s list beat Apple and regained the throne. Since the release of AI Strategy, Google continued to spark with high popularity in technology sector. Apple relegated to second place and Amazon continued to maintain its third place with its new retail model success. 233 US brands were in the list, indicating US’s first place with strong power of brands. China had only 37 selected brands, which did not match the status of its second largest economy in the world. 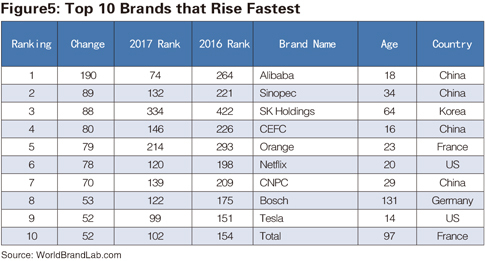 Some of the best-performing brands are State Grid, Tencent, Haier, Huawei, CEFC China Energy, Tsingtao Brewery and Wuliangye. Based on brand’s global influence, the ranking list of the " the World’s 500 Most Influential Brands " has been released for 14 consecutive years. 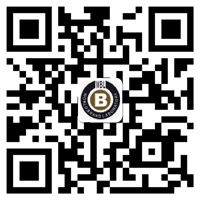 Brand Influence refers to ability of brand to open up the market, capture the market and earn profit. 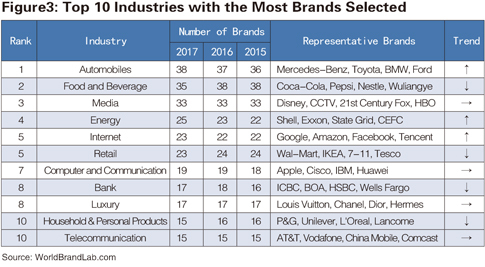 According to three key indicators of brand influence, namely Market Share, Brand Loyalty and Global Leadership, World Brand Lab scored more than 20,000 famous brands around the world and eventually launched the world's most influential 500 brands. 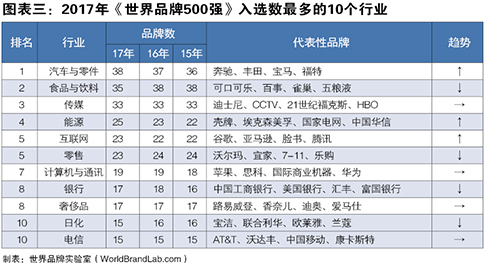 The the World’s 500 Most Influential Brands list includes brands from 28 countries. From the nation distribution of the brands, the United States occupies 233 out of the top 500, keeping its brand superpower. The traditional European powers France and UK have 40 and 39 brands, respectively, ranking second and third places. 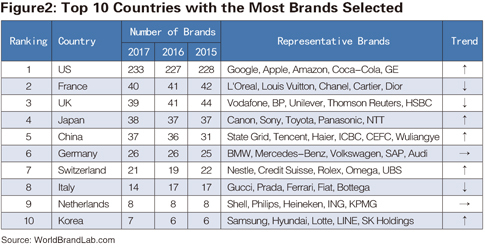 Japan, China, Germany, Switzerland and Italy are the second camps for brand powerhouses with 38, 37, 26, 21 and 14 selected brands respectively. Thus, despite the economic downturn in Europe, the super-brands in Europe and the United States seem to be firm. Although 37 brands are selected in China, Chinese brands are clearly still in the "third world" as it owns 1.3 billion populations and is the second largest economy in the world. This year, the “the World’s 500 Most Influential Brands“ covers 56 industries in total. 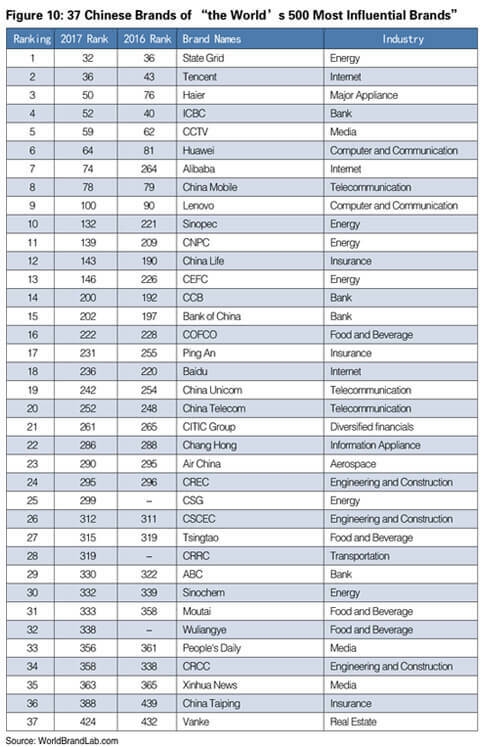 Among them, the automotive and parts industry with a total of 38 brands listed, ranking rises to the first; food and beverage industry with 35 brands ranks second; after last year's heavy hit, media industry still ranks third this year, with 33 brands selected. Energy (25) and Internet (23) industry both have a slightly larger proportion. The global Internet market has kept its rapid growth in the past year. By the end of 2016, the number of Internet users in the world reached 3.4 billion. China is still the largest Internet user market in the world. 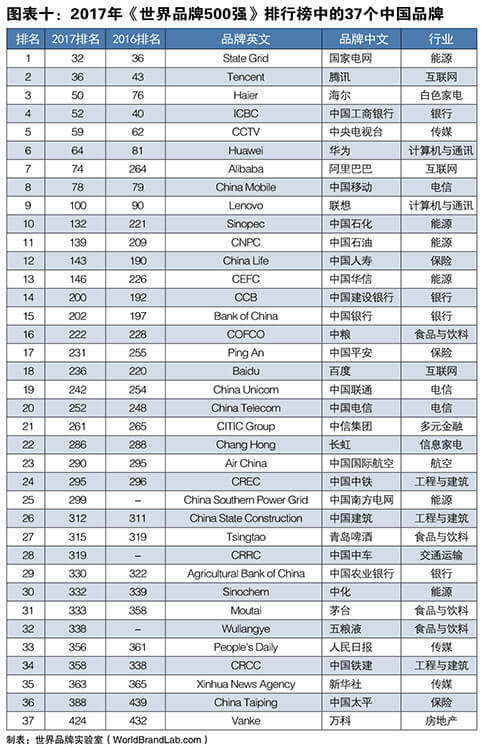 A total of 38 brands are newly listed this year, and these brands are scattered in various industries. Among them, there are 24 brands from the United States, the rest from China (3), Switzerland (3), Japan (2) and so on. As a powerful country in brands, the United States has leaders in all industries. The newly listed brand Dell, one of the largest PC manufacturers, has taken a turnaround since the transition in 2013. Kia Motors from South Korea and Tokio Marine from Japan are also included in the list. The newly listed China Southern Power Grid, CRRC and Wuliangye from China have all been well-known worldwide. Under the influence of THAAD, the retailer Lotte's business in China was almost paralyzed, making it the biggest loser this year. Mitsubishi got bad reputation as a result of the scandal and the rank dropped 104. Nissan, the model sample in Japanese manufacturing industry, was blasted for its 38-year low quality check, resulting in factory shutdown, car’s recall, sales decline, and slumped brand value. Brands that are suffered from scandal and declining ranking also include Uber. the Internet sharing economy is booming, but Uber’s scandal made its market share decline in recent years, validating its deterioration in brand image. It is also worth mentioning that the rapid development of emerging industries and the decline of the traditional time-honored industry has a sharp contrast. The time-honored cell phone manufacturing industry continued to decline, and Ericsson, the cell phone giant once, has dropped out of the top 500 list. The average age of brands on the list in 2017 reaches 100.19 years old, up from 93.71 last year. Of these, 216 were time-honored brands which have the age of 100 and over. The United States accounts for 40% with 94 brands. Two well-known British universities Oxford and Cambridge, respectively, are listed as the top two oldest brands. The historical accumulation of the school is the best representation of the weight of knowledge. Apart from the famous universities with a long history, China's Moutai is the longest-running brand in the business world. 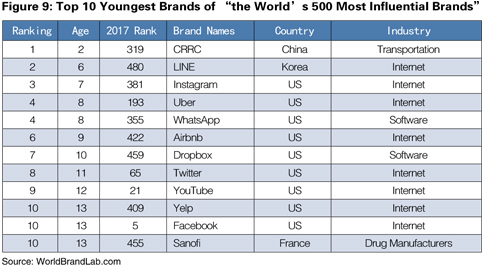 In addition, Saint Gobain and Rémy Martin, two time-honored French companies, were 352 and 293 years old respectively, and top among the oldest brands. 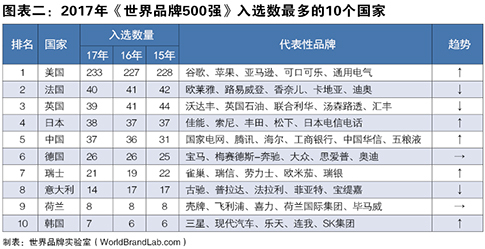 Among the 37 brands selected from China, only Moutai , Tsingtao , Wuliangye and Bank of China reaches the age of 100 and over. By industry, brands in food and beverage industry are the oldest, with 27 selected brands over the age of 100. 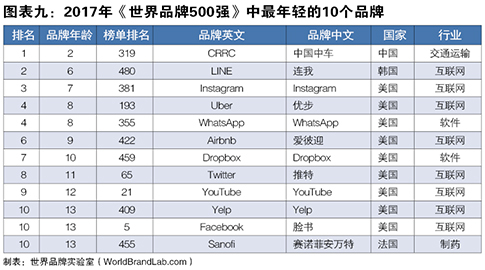 The brands in Internet industry are the youngest and brands, such as LINE, WhatsApp and Instagram, already earn hundreds of millions of users and become world-class brands although they are all less than 10 years old. According to Miguel Villas-Boas, professor at the Haas School of Business at the University of California, Berkeley, in view of the small number of selected Chinese brands: “In the past, the naming, pricing and image design of Chinese brands were not sufficiently internationalized. In the future, with the global popularization of mobile networks and social media, Chinese brands will have easy access to end-users in all countries and rapidly narrow the gap with world brands. " According to Professor John Deighton of Harvard Business School, "Chinese brands are not well established in the US and Europe first-tier markets, but their brand strategies have been successful in second-tier markets such as Africa, South America and South Asia. For example, in Africa, the sale volume of Chinese brands phones exceeds those of Apple and Samsung. " Robert Mundell, chairman of World Brand Lab and Nobel laureate in Economics, said, “the charisma of brand value can often be reflected in the capital markets. For example, the market capitalization of Apple, Google and Amazon is 8900 billion, 750 billion and 560 billion US dollars respectively. The brand value would at least account for 60% of such high market capitalizations. 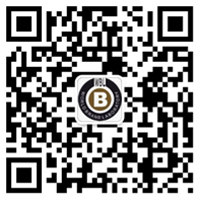 Chinese government should adopt various channels to encourage enterprises to implement brand strategy. 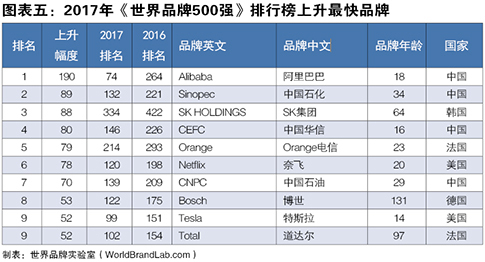 For example, there are around 5000 Super Brands in the Chinese domestic market and many of them are not publicly listed for funding. However, they can be encouraged for brand securitization to generate cash flow. Brand securitization has been prevalent in Europe and the United States for many years as an important financial tool. The full list and analysis report of the “World’s 500 Most Influential Brands“ is published in the 12th issue of Boss magazine, subsidiary of World Executive Group. Since 2003, World Brand Lab has been tracking more than 40,000 major brands in 50 countries in the world and has established the largest world brand database. World Brand Lab is the world's leading brand consulting, research and evaluation agency. 1999 Nobel Prize-winning economist Robert Mundell serves as the president of World Brand Lab. World Brand Lab is a wholly owned subsidiary of the world-leading strategy consulting company World Executive Group (icxo.com). World Brand Lab is committed to brand valuation, brand strategy, brand naming, brand design, brand protection and is comprised of experts and consultants from Harvard University, Yale University, Massachusetts Institute of Technology, Oxford University and University of Cambridge. Their significant research findings have been applied by many enterprises as important references of intangible asset evaluation in mergers and acquisitions (M&A) processes. 1. This ranking list is exclusively compiled by World Brand Lab based on four indicators: Brand Influence, Market Share, Brand Loyalty and Global Leadership. 2. The brand age of the joint brand after merger will be the older one before merger, for instance, Reuters was established in 1850 and Thomson Group was established in 1953, then the combined Thomson Reuters brand age should be from 1850 onwards.